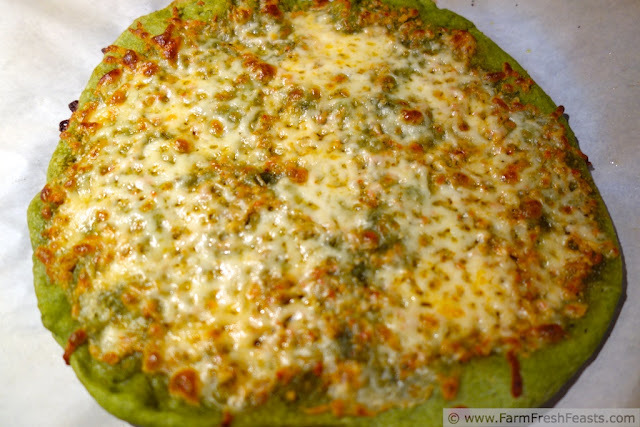 Farm Fresh Feasts: Not-So-Simple Cheese Pizza (Fresh Tomato Pesto Sauce on Spinach Crust) Pizza Night! 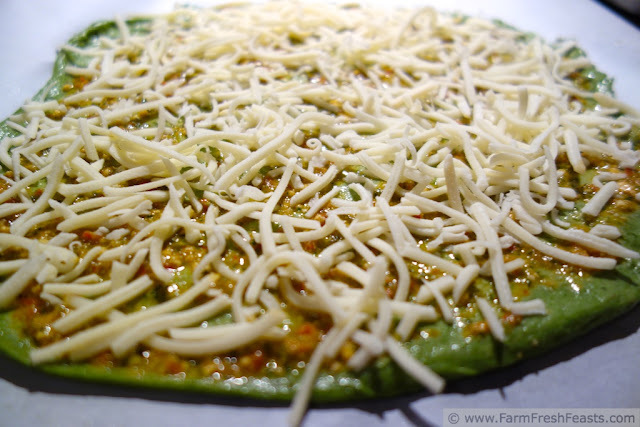 Not-So-Simple Cheese Pizza (Fresh Tomato Pesto Sauce on Spinach Crust) Pizza Night! So says my daughter when she spied this pizza coming out of the oven. If the people you feed don't like green in general, try this pizza. It's the first way I got my kids to eat spinach, and remains a tasty option when I get spinach in the farm share. Especially when it's cold and my body craves warm things, not cold green smoothies. Seasonal eating at its best. This pizza uses the spinach crust from my Deployment Pizza, adds a (put up, from my freezer) fresh tomato pesto from Heather at In Her Chucks, and tops it off with a creamy Philly-Italian shred blend. Tonight's tomato pesto sauce uses red farm share tomatoes, arugula pesto, and cashews. It's delicious--as are all the permutations of fresh tomatoes, green herbs, and salted nuts that I've tried so far. 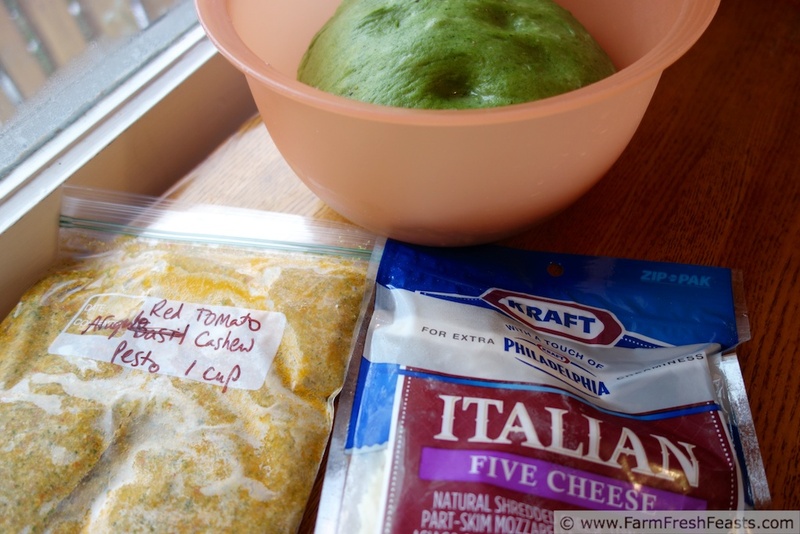 I cannot wait until summer when each week I plan to whip up a new fresh tomato pesto for the pizza. For now, however, I'm delighted I discovered Heather's recipe in time to put up several batches of sauce for pizza. If you look close, you can see my cashews. Preheat oven (and a baking stone if you have one) to 450 degrees Fahrenheit. On an oiled piece of parchment paper, stretch out the dough to a reasonably circular shape. Let it hang out for a while (30 minutes) if you'd like the crust a bit fluffier, or go straight into topping and baking if you'd prefer a thinner crust. Spread the fresh tomato pesto across the crust. If it's previously frozen, you're welcome to drain the juice that may have accumulated at the top. Or stir it in, your choice. I've done both, and notice that with a wet topping my pizza is wetter if I don't drain the juice. I don't consider cheese to be a wet topping, so it shouldn't make much difference. Top with cheese. Bake, on the parchment, for 5-8 minutes. Shake the pizza off the parchment onto your baking stone or cookie sheet, and continue to bake for 3-5 minutes until the cheese is browned and bubbly. Cool on a rack a couple of minutes for the cheese to set up, slice, and serve. This post is linked up with What's Cookin' Wednesday at Buns In My Oven and Taste and Tell Thursdays. Your idea sounds better than 'How to Turn Your CSA Box Into A Pizza Every Week' like I was kicking around. It's been super fun dreaming up new combos though--it's past the season for what we ate a couple of hours ago so I won't put it up here for a long while, but, would you believe fig jam, goat cheese, and prosciutto on an eggnog/butternut squash crust? Crazy tasty. "It's delicious--as are all the permutations of fresh tomatoes, green herbs, and salted nuts that I've tried so far." You really can't go wrong with fresh tomatoes, green herbs and salted nuts. I love your pizza nights, and I love the spinach crust. Great color. If you want green color, stay tuned for the leek, cabbage, and potato one on a spinach crust coming up later. That is so tremendously green. And delicious. (You can leave off the bacon). I'm kicking around other colors . . . I think beets in a crust may make an appearance. My farmer sent an e-mail saying we might get beets in our next Winter CSA box - I hope so! I LOVE beets in any form and have been wanting to try them in a dough ever since you suggested it for purple ravioli. I did notice that the slice link didn't work though. Thank you for checking. I hope I have fixed the links to the products I use and love. How cool is that? My son just came home from school and fixed himself sliced carrots and hummus for a snack. I am seriously loving this! 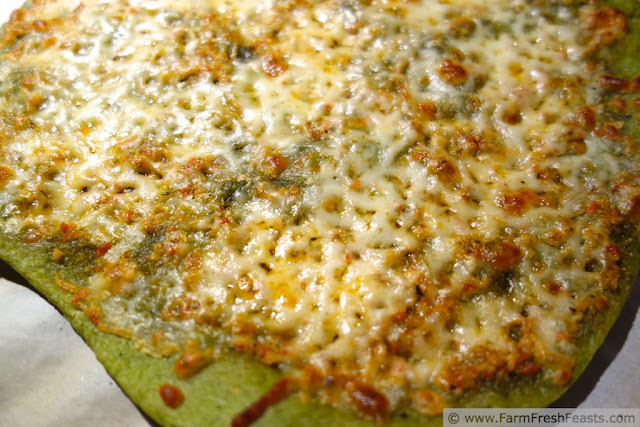 I love the spinach crust - what a great way to get your greens in, and the pesto sounds like the perfect thing with it. Thanks so much for linking up to Taste and Tell Thursdays! Thanks for hosting--I sure enjoy seeing a wide variety of recipes in a single place!